Below is one of the best videos I have seen demonstrating the rights and responsibilities of bicyclists in traffic. Everything explained and shown in this short film is consistent with Illinois law. On Tuesday, a 29 year old graduate student was struck by a car while riding her bicycle in the bike lane along north bound North Milwaukee Avenue just after 3:00 p.m. The cyclist was struck from behind as she approached the intersection with North Rockwell Street near the Congress Theater. The impact threw her from her bike and into the street where she struck her head with force significant enough to crack her helmet. She briefly lost consciousness. An ambulance took her to Saints Mary and Elizabeth Medical Center on Western Avenue, nearby. Though she has been released from the hospital, she continues to receive treatment for her injuries. Our law firm has been retained to represent the bicyclist. A great way to remind drivers that bicyclists have the same rights to the road as cars is to advertise that fact on your own vehicle. 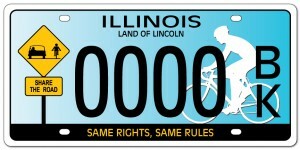 The design of Illinois' new "Share The Road" license plate has been approved and the Secretary of State is now taking orders. If you read this blog and live in Illinois get one. Do it! This is an inexpensive way to send an important message to drivers that bikes belong (on the road, not the sidewalk), and to re-enforce that we are traffic. Click here to get the short order form. Fill it out and send in your seventeen bucks. Once the Secretary of State gets 1500 requests, production will start and the plates will go out. If every Illinois resident who reads this blog orders a plate production will begin very shortly. "It was funny," says Thompson, an architectural engineer, "because we'd been drinking. All we could think was: Hey, he's not in bad shape." Thompson cycles home from bars as a matter of course, "because it's faster than walking, and who can afford to take cabs all the time? By cycling, I feel like I'm doing something beneficial to society, and whatever the risks are, I know they're nominal compared to driving under the influence and possibly killing someone." While drunk drivers menace everyone, "drunk cyclists pose a risk to other bicyclists and to pedestrians. Of course, the drunk bicyclist poses the greatest threat to himself or herself," says Kevenides. According to the National Highway Traffic Safety Administration, nearly one-third of the bicyclists killed in U.S. traffic crashes in 2008 had a blood-alcohol content of at least .01 grams per deciliter. Nearly one-fourth had BACs of at least .08 g/dL, the national legal limit. It can also land you behind bars, depending on where you do it. Unlike DUI laws, BUI laws are notoriously hazy and site-specific. In Vernal, Utah, two years ago, a pair of archeologists cycling home from a bar were pulled over, given sobriety tests, handcuffed, jailed overnight, and charged with driving under the influence. Two months ago, a man in Boulder, Colorado, was arrested for BUI after hitting a car with his bike and trying to run a red light; it was the third such ticket issued in Boulder this year. And in Germany last year, a student caught cycling home intoxicated from a party was fined €500 ($700) and banned from riding a bicycle on German streets for 15 years. "It is unlawful for any person to ride a bicycle upon a highway while under the influence of an alcoholic beverage," reads California's Vehicle Code; offenders face base fines of $250. Earlier this year, a Washington, D.C. court found that BUI falls under that jurisdiction's DUI law. But biking while blitzed is technically legal in Illinois. "Our appellate court held in 1995 that the state's DUI statute, which provides for some very stiff penalties, does not apply to cyclists caught biking under the influence," Kevenides says. "In the tumble, a brown bottle fell and broke, leaving sharp, curved chunks and shards of glass sticking up like a bed of nails. As the riders picked one another up and dusted themselves free of the glass from what was evidently a beer bottle, a passing cyclist said drily, 'That's why you drink from cans.' "This illustrates to me how acceptable drinking and bicycling is to some people who presumably wouldn't feel the same way about drinking and driving. A passerby not only doesn't criticize, he advises on how to better drink while bicycling." But drunk biking has its points, he concedes. "It surely helps overcome fear of traffic and creates social bonds. In this sense, the dangers of alcohol—itself a toxic swill—and biking under the influence may pale in light of the benefits: a more healthy and sustainable transportation mode emerging against great odds and obstacles. Getting doored scares the bejesus out of me. I've offered tips on how to avoid it, but those suggestions are far from foolproof. The truth is that the door that gets you is like a snake hiding in the tall grass; you never see it before it strikes. I was interviewed by Bob Seidenberg of Pioneer Local for the piece below appearing in the Evanston Review. It provides a horrific account of what can happen when a driver carelessly opens a door without looking. While I don't know all of the facts, based on those recounted in the story I don't agree with the suggestion at the end of the piece that just because the driver's traffic citation was dismissed that pursuing a civil case against her is made more difficult. One really has no bearing on the other. 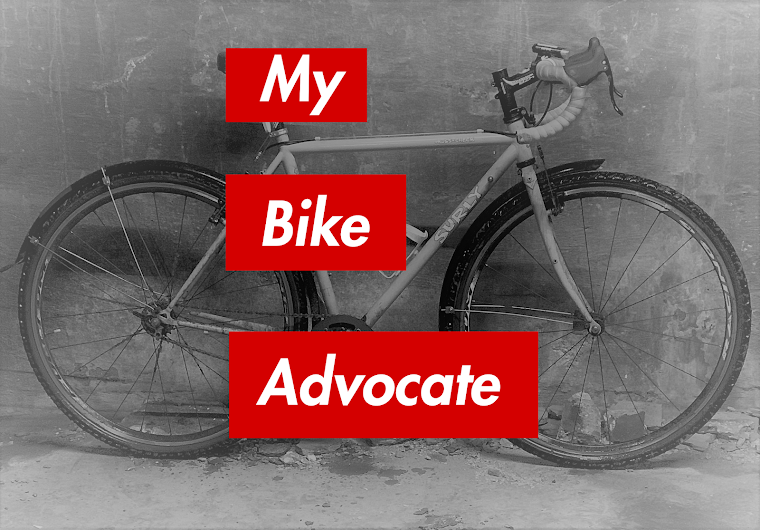 I have represented cyclists in car vs. bike cases and successfully resolved the civil case even after a not guilty finding on the accompanying traffic citation. In Mr. Saldana's case, I frankly don't understand what the driver's testimony was or even who offered it at the traffic hearing. It sounds like her lawyer testified. I am not sure how or why that was permitted, but it certainly would not be allowed in front of a civil jury. The driver would have to testify on her own behalf. Also, I don't get her explanation about reaching for an iced tea. Was there an bottle/can/cup of iced tea located next to her vehicle that she opened her door to retrieve? If so, it does not matter why she opened her door. What matters is that she did so without looking for cyclists. Or, was she reaching for her tea inside her vehicle and claims to have never opened her door at all? Documentation (photos or repair bills) of the location of any damage to her door should shine a light on the truth. Also, the nature of the injury to Mr. Saldana's arm itself strongly suggests that the cause was an open door. It seems unlikely that he would have sustained the tearing injury described in the story if he just crashed into a closed car door. In any event, thanks to Bob Seidenberg for bringing this terrible event to light. Hopefully, it will help remind drivers to look before opening their doors. Carlos Saldana might have come to better terms with the accident that nearly severed his arm June 4 had he ignored the steps bike advocates are always urging for safe riding. The 25-year-old bicyclist wasn't wearing an iPod. He wore a helmet and bright clothing, even though the accident occurred about 4:30 p.m., well before dusk. Riding north on Asbury, he had just passed Howard Street and was riding in a shared lane for motorists and cyclists. He was about 10 feet from a parked vehicle with four occupants. "She (the driver) opened the door slightly to 'look,' and then opened it more, very quickly," he said. "From the one second she opened the door to one or two seconds, I couldn't avoid it." He tried to swerve away, but his arm hit the steel door. He flew about 10 feet into the street and rolled right to his feet. His right biceps muscle was severed to the bone. Saldana used his shirt as a compress. At the emergency room, doctors stitched the muscle, closing the wound with 16 staples. Because of its suddenness, getting "doored" -- colliding with a car door opened carelessly by a driver who doesn't check the side mirror first for moving traffic -- ranks as one of the biggest concerns of urban riders. "It is perhaps the No. 1 fear that bicyclists have in areas with heavy on-street parking," said Brendan Kevenides, an attorney who specializes in bike injury cases. "The thing that makes it so scary is that it can happen so suddenly. It can be very difficult to foresee." The effects can prove devastating, as in Saldana's case, he said. James Heller, president of the Evanston Bicycle Club, has been doored four times. Some riders, including Heller, have taken to attaching a flashing light to their handlebars to draw motorists' attention as they approach. They use it during the day as well. "It catches your attention -- 'Oh, there's a bike rider,'" he said. Several years ago, legislators made dooring a violation. Illinois law stipulates that "no person shall open the door of a vehicle on the side available to moving traffic unless and until it is reasonably safe to do so." Evanston police will ticket offenders if they are at fault, said Sgt. Thomas Moore, in charge of the Evanston Police Department's traffic division. Moore is aware of several instances of cyclists being doored around the Jewel supermarket on Chicago Avenue. "You have to be aware of your surroundings; make sure it's absolutely safe to open that door," he said. Indeed, the officer did ticket the driver of the vehicle in Saldana's case, an elderly woman in her 60s. The lawyer appeared in court, testifying in Saldana's behalf. In court, though, the woman changed her story, saying she was reaching down for a bottle of iced tea when Saldana's bike slammed into her vehicle's door. The judge released her from any fine. Saldana could still pursue civil penalties, but it may be more difficult after the ruling, which he said amounted to "a slap in the face to all bicyclists." Regular readers of this blog probably recognize that I am a big fan of bike lanes. Giving bicyclists their own clearly defined space on the road encourages more people to ride. More people on bikes means more motorists get used to seeing cyclists. That increased awareness should decrease the number of car vs. bicycle mishaps. In Chicago, bicyclists do not have to ride in a bike lane. It is legal to ride with the rest of traffic most of the time. Still, if you are involved in a crash with a motor vehicle you are probably better off having been in a bike lane. As sure as the day is long, in a bike accident case the defendant motorist will claim I didn't see him/her, I couldn't see him/her, I never expected him/her, or some variation of the theme that that the cyclist popped up out of nowhere. However, this defense is a much harder sell to a jury if the incident occurred in a bike lane. The presence of a clearly marked bike lane makes the presence of bicyclists foreseeable. A bike lane puts the motorist on notice that caution must be used to look for cyclists in the area. Thanks to Joe TV for bringing this video to my attention over on the Chainlink. Yikes! 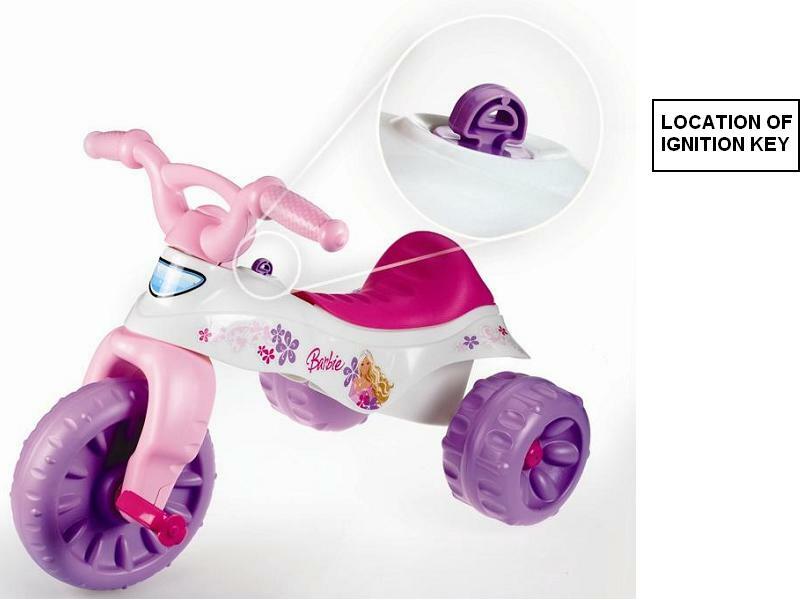 Fisher-Price, the U.S. Consumer Product Safety Commission and Health Canada announced the recall of certain toddler tricycles. The plastic trikes were designed with protruding pretend ignition keys located near the seat that a child can become impaled on resulting in injury, "including genital bleeding." There have been at least six reported incidents involving girls aged two to three where medical attention was necessary due to the location of the keys. 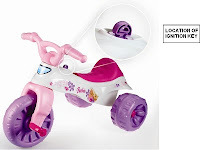 According to the Safety Commission, "Consumers should immediately place the trikes out of children's reach and contact Fisher-Price for a free replacement key." To learn more and read the full press release click here. An investigation is ongoing and charges are pending against a Woodstock man who struck a father and daughter with his car as the two were out bicycling on Sunday morning. The two, Felipe Ortiz, 55, and Maria Ortiz, 21, were airlifted from the scene to Advocate Condell Medical Center. As of last night they were in stable condition. The incident took place along the 9700 block of McConnell Road in unincorporated Woodstock. Little has been reported describing how the incident happened. The Daily Herald notes that the father and his daughter were riding along the south edge of the block and that the driver had been traveling eastbound before crashing into them. A 69 year old man died Friday of head injuries he sustained when he was struck by a car while bicycling in Alsip. Encarnacion Solano of Blue Island was riding near 123rd Street and Springfield Avenue on Thursday afternoon when he was hit. He passed away from his injuries at Christ Medical Center in Oak Lawn the following day. This tragic incident was reported on by The Southtown Star.